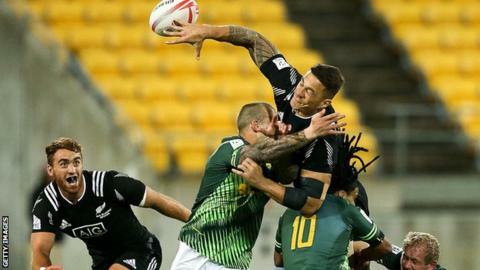 Sonny Bill Williams scored a try with his first touch on his rugby sevens debut as New Zealand topped Pool A at the Wellington round of the Sevens World Series. The two-time union World Cup-winner crossed in a 38-7 win over Russia. Williams, 30, has committed to the New Zealand sevens team with the aim of playing at the 2016 Olympics in Rio. He has also previously represented the Kiwis in rugby league and held the country's heavyweight boxing title. Williams played three matches as Sir Gordon Tietjens' side reached the quarter-final against Kenya, also setting up a crucial, last-minute score in a 19-14 win over against South Africa. New Zealand also beat Scotland 27-7. Williams has described his switch to sevens as an "awesome opportunity", adding: "The best sportsmen ever have been Olympians: [Usain] Bolt, [Muhammad] Ali."